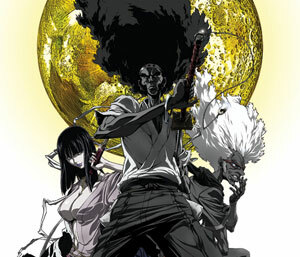 Afro Samurai: Resurrection premiers in the US on Spike TV Sunday, January 25 2009 From 10:00 PM – Midnight, ET/PT FUNimation plans will released the feature on DVD and Blu-ray on February 3rd. Samuel L. Jackson will reprise the role of Afro (and Ninja Ninja), opposite Lucy Liu as new nemesis Sio. Additional casting includes Mark Hamill as Bin, Sio's manservant and protector and Yuri Lowenthal as Kuma, the teddy bear-headed warrior from the original "Afro Samurai" series. A few years have passed since Afro's nemesis Justice was finally defeated on Mt. Shumi. Afro is back in his Swordmaster's dojo meditatively carving statues as penance for those he has murdered. The blood cycle is broken - the wearer of the "No.1" headband shall rule the world and only the "No.2" shall challenge the "No.1," but Afro holds both headbands and so there is no challenger. The fragile peace Afro has created is shattered as ghosts from the past appear and wreak havoc in Afro's dojo, escaping with the No.1 headband and also with the remains of Afro's father. Afro is forced once again to take on the burden of the No.2 headband and go back out into the world in search of the No.1 and his father's remains. The power of the two headbands is felt in the world once more, the world is once again painted with blood and the spiral of violence begins once again. My opinion of the original Afro Samurai has improved the more times I've seen it. I probably will not catch Resurrection until the DVD is released, but I'm certainly looking forward to it.